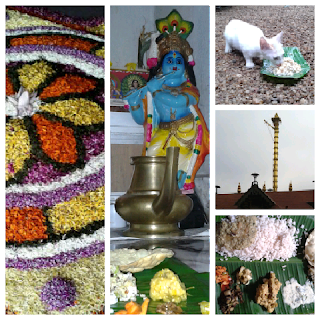 Onam 2012 arrived in the usual festive splendour and a week of merry making just passed by. One of the amusing things I find about festivals back home is the emphasis on gastronomical delights. Not that I don't love them but its funny that you visit all your relatives and the first thing they want you to do is to sample their culinary recipes. And these may not be any different but the same recipes that you have just tried out a couple of hours back at another place. Probably my observations may be a little biased, since I didn't partake in many of the Onam games that were held at the local village square. This year even missed out on watching the traditional boat races at Aranmula.